I realize that it’s been a long time since you’ve peeked at my words. I haven’t forgotten you, and I hope you remember me. Instead of writing my usual lengthy blog about what’s been going on, I’m going to do several short notes. A new one every week or so. Hope you dig them. Friends call and ask, “How are you doing, man?” I tell them that I take all of the difficult stuff that I’m going through, and try to “positive-ize” everything. I try not to let things keep me down too long. Life’s left hooks are hard, but I get back up as soon as possible and send a round-house punch. Go for a knockout, you know. Or I keep fighting until I can make my way clear. 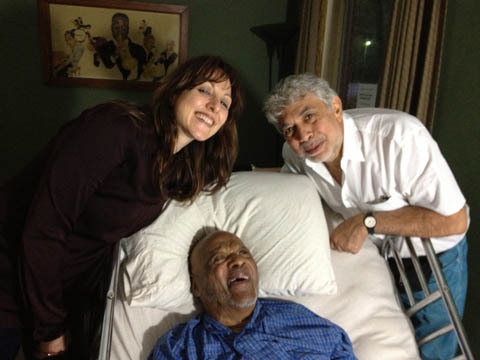 My dear friend Monty Alexander and his wife, Caterina took some time out of their hectic schedule and came here to visit. Man, what a nice surprise! I love to talk about boxing, you know. I was a pretty good boxer back in my day, and I really enjoyed shooting the breeze with Monty about today’s champions. He brought me a letter from Archie Moore, one of my all-time favorite champions. He had a whaling record – 127 KO’s! Archie’s letter was written on my old stationery, and I got a big kick out of it. I told Monty about the time that Archie and I were on The Tonight Show. He was hitting the speed bag, while I was playing my trumpet with boxing gloves on. What a gas! Johnny Carson loved it. There’s a piano at the foot of my bed, and Monty played some m-e-a-n licks. I jumped in with some “Mumbles,” and right then, B (Bill Cosby) called. Gwen held the phone to my ear while B joined in singing jokes. We had a ball! I mean, we cut up a while! B and I go waaaaay, back. It was great to spend time with him and Monty. It was a spirit-lifter for the three of us. And now, I want to share something else with you that made me very happy. A while back, I received a request from an eighth grade student named Meghan. She wanted to interview me for her school report, which included highlights from my career. Well, my hearing “ain’t what it used to be.” So, Gwen was by my side to make sure that I heard Meghan’s questions correctly. It was a lot of fun. But, I must say that the whole scene made me more aware of the fact that I need to do a short autobiography for young students. You know, no profanity and things like that. So, I’ve been working on a new book with Gwen. Meghan and her mom gave me permission to share that short video, which Meghan put together on her own. I’m very proud of her, and I hope you enjoy it. To me, it’s always hip to take time for young people. Help them, you know. No matter what is going on. I felt so honored to help Megan. Okay, that’s it for this week. Lots more to share with you later. Shoot me a line in my Guestbook if you like my shorter blog format. And, I just want to take a few moments to thank you all for helping me to stay on this side of the grass. I couldn’t make it without you, for sure. Big Prez (my nickname for God) knows how much you all mean to me. Some of my friends organized a contribution campaign for me, and it’s really growing. I am so grateful. If you feel inclined to join in, I would appreciate that very, very much. I was 9, and my parents let me stay for dinner with you. You gave me a boxing lesson and told us stories of Louis Armstrong and Ella Fitzgerald and even played a note or two in our living room. I still have the album you signed for me. I’ve been playing trumpet ever since. You’re an inspiration and one of the best teachers I’ve ever known. Thanks for getting my trumpet career started off right. THANK YOU for being such a great inspiration for me for 35 years now ! I’ll keep on blowing my horn for you…. Trumpet player and student, Martín Puig from Uruguay, South America. I will never forget seeing you and Red Holloway at the Jazz Showcase on a winter night in Chicago or you at the Village Vanguard in NYC. Pure, infectious love and joy! You are a gift and a blessing to all who have heard you, met you and learned from you. Thank you so much, and especially for your work with young people. All the best, and much love and strength to you. … INCREDIBLE planned for you. We love you very much. Keep on keepin’ on, right? Zoe and I were talking about boxing tonight and quickly switched to the main event: YOU! Not a day goes by without your influence being felt by those around us. You are amazing. We hope you know that. I remember when you came to the Santa Rosa Jr. College in N. California and sat in with our big band concert, What a great honor. I have moved on and have worked with the likes of Sunny Murray, Don Cherry, Bill Dixon and Cecil Taylor among others. Have been living in Vienna now since 9 years and am Artistic Director of the Neu New York Institute of Improvised Music. I’ve read your autobiography and enjoyed it very much! Keep spreading your words of wisdom to the world. Looking forward to seeing the shortened, cleaned autobiography finished soon. Josh, Noah and I (your “California Trio”, though currently spread out all over the country) send you gallons of greetings, lots of love, and astronomical amounts of appreciation for all of the joy, love and brilliance you continually share with us and so many others in this world! You’re still lovely as always man!